It’s not like this anxiety isn’t substantiated. We’ve all read the headlines of double-digit sales activity declines & hundreds of thousands slashed from list prices. Even worse is that amidst the rise in inventory there is a decline in the number of Buyers entering the housing market. According to the Statistics Canada Census 2016 data, the percentage of households that own their home fell to 67.8% in 2016 down from 69% in 2011. The largest declines were found in cities that have experienced the largest growth in housing prices, such as Toronto, Vancouver, & Victoria, B.C. Quick translation: Sellers are faced with more competition, declining prices, & fewer Buyers. These are the moments when armchair real estate experts will tell you to hold off on selling your home. It also ignores the fact that many Sellers don’t list a home simply because they feel like moving. New jobs, changing financial circumstances & other life events are the typical prompts for listing a home for sale. A first impression is often a lasting one & this applies to how Buyers first see your home. You want to really leave an impression—a good impression—that means preparing your home to look its best. Quite often, when a Seller renovates simply for resale, the dollar invested isn’t a dollar earned. Don’t believe me? Check out the annual “Cost vs. Value” report from Remodelling Magazine. Each year, a number of projects are assessed based on their popularity & their resale value. Each year the results end up surprising Sellers & HGTV-inspired homeowners. For instance, a major kitchen remodel (which ranges from $30,000 to $150,000 or more) will earn you $0.53 to $0.59 for every dollar spent. Renovate a bathroom to offer a more luxurious experience & you’ll probably earn about $0.53 for every dollar spent. Despite the appalling returns on these so-called home reno investments, there are still some smart places to spend money. Redo or clean up your home’s gardens & lawns, power wash pathways (as well as the driveway) and consider painting the exterior of the place, if this job hasn’t been done in over a decade. You can also spend smartly inside the home, such as updating old-fashioned light fixtures, wall plates & drawer knobs to more contemporary selections. Replace carpets (or, at the very least, get them steam cleaned) or pay to refinish rough or stained hardwood floors. Want to add $5,000 to the sale price of your home? Pack 10 boxes of clutter & cart it away. According to professional organizers, each box of clutter that’s removed from your home before listing it for sale can add as much as $500 to the value of your home. By removing clutter & personal belongings, a Buyer can focus on the home’s qualities rather than the homeowner’s lifestyle. So, rather than focusing on family photos, your spoon collection & kids’ artwork on the fridge, Buyers can focus on how spacious the family room is or how much light the kitchen gets in the morning hours. Want to sell your home in a down market? Then you’ll need to focus on the best ways to market your home. For those with a desire to save quite a bit of do’s & don’t mind doing the work, you’ll need to investigate the best ways to market your home. This could include online strategies, as well as in-person or over the phone strategies. Just be sure you can invest the time & money to do this part of the job properly because if you don’t it could mean your home languishes on the market—the “comparison” home that helps sell other properties. For those with no desire to learn the trade secrets of a real estate agent (or those who already work a full-time job & have no time to do another job) consider finding the right agent that will work smart to sell your home. Ask friends & neighbours for references & then consider the agents who appear to consistently work your neighbourhood. No matter how you find the agent, be sure you interview at least three, if not more, before making a selection. Ask each agent specifically what they will do to market your home, who will be working with you (some high-profile agents get your business & then ask a junior associate to do all the work), & how many clients they work with at any given time. You want an agent that will work to earn their commission & that means a real estate professional who takes the time to learn the best strategies & stay current with the market while maintaining respectful, honest relationships with their clients. Avoid agents who promise a fast sale or guarantee an above market price for your home. No one can guarantee this. It’s just a cheap ploy to get your listing. Now that your home is ready & you’ve either got the knowledge to market your home or the professional who will do that work for you, it’s time to assess the current housing market conditions. This is where national sales activity averages & median Canadian prices won’t help. You need to go beyond general national statistics & drill down into precisely what is selling in your specific geographic location, & when. A recent analysis examined monthly sales activity in the Greater Toronto Area for the last 18 years. By reviewing sale prices, the percentage of list price (how much the house sold for when compared to the list price), the days on market & the average length of time it took to sell a home each month, this analysis revealed some startling facts. The big takeaway: If you’re looking for top dollar, springtime isn’t always the best time to sell a home. 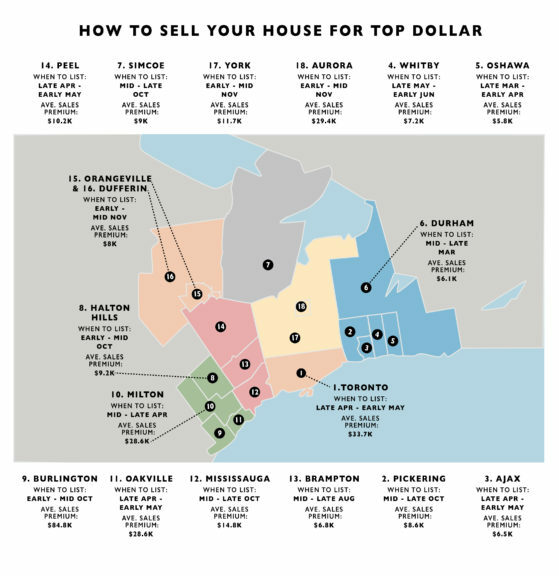 For instance, if you are selling a house in the Pickering, Simcoe, York, Mississauga, or Aurora areas, you may want to wait until the Fall, where the premium for waiting to sell will net you an extra $8,600 to $29,400, on average. However, property owners selling a house in Metro Toronto should stick with listing in the spring, when the average premium for listing at this time will net you an extra $33,700, on average. Things change again if you’re selling a condo. For Metro Toronto condo owners, consider waiting to list until October, when the premium for waiting could get you an extra $6,000 on the sale price, on average. The same applies to those selling a condo in Aurora or Burlington. 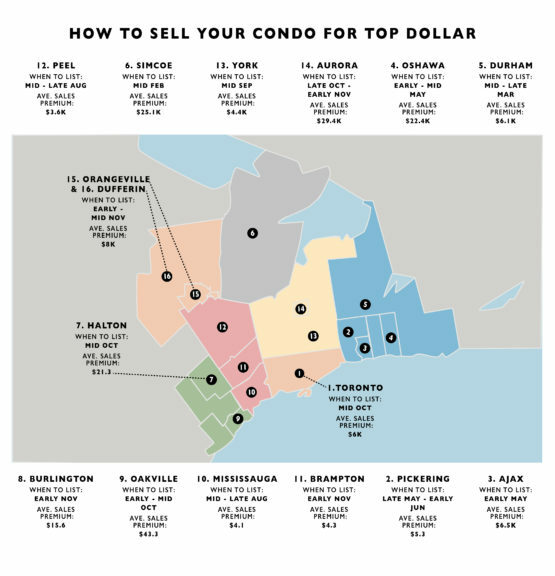 However, property owners selling a condo in Oshawa & Pickering will want to list in the later spring months to try & capitalize on the average premium of $22,400 or $5,300, respectively. Perhaps the single most important factor when selling a home in a down market is to list it at the right price. Price it too high & your home will sit on the market, becoming a comparison show home that helps sell other properties on the market. To set the right price, Sellers need exact information on properties that recently sold, the similarities & differences in those properties to their home & the market conditions for their community & property type. For sellers choosing the do-it-yourself option (known as For-Sale-By-Owner), you can find sold information on many real estate brokerage sites. If you opt to work with a Realtor, ask this professional for a market analysis (known as a CMA). Many agents will limit the number of properties used in the CMA, in order not to overwhelm their clients. If you’d rather have more information & more comparisons, then don’t be afraid to ask. The right agent will be happy to help engaged & motivated Sellers. Most Buyers begin their search online. Survey after survey shows that Buyers consider photos as the single most important selling tool. That means you do not list your home without photos. Period. Full-stop. No exceptions. Some agents, in their rush to secure a listing, will try & pressure you to list a home before pictures are available with the rationale that you can always add the images at a later date. Don’t do this. Your home will be 100% fresh only once—the first time it hits the market. This is when it will first go out to Buyers who subscribe to new listing newsletters & Buyers interested in homes listed for sale within certain areas. Don’t blow this opportunity by listing a home with no photos. For outside shots, consider taking the pictures just before dusk, when most photographers would agree that outside light offers the perfect contrast to produce exceptional photos. In the end, you want to make your home look like a Hollywood star. No joke. In a Buyer’s market, you have to be prudent & quick. This means responding to all offers, even if the buyer offered an insulting low-ball bid. Remember, most Buyer traffic will come in the first several weeks of a listing, so it’s never a good idea to ignore a bid even if it does feel like a bit of an insult. While a low-ball offer may hurt, it’s still a clear indicator that a Buyer is interested in the property. Keep that interest going until you can help them see that your price & terms are reasonable (assuming you priced the property competitively in the first place). Another reason is that an offer in-hand can entice other Buyers to move quicker. No one wants to feel like they lost out, so adding a bit of urgency can prompt Buyers who are on the fence to act. Since a formal counter-offer can legally bind you to negotiate with just one Seller, consider talking with your agent about how to keep your options open. Perhaps your agent can have informal chats with the Buyer’s agent about possible terms & conditions that both parties will agree to; or you could add in a clause to a formal counter-offer that frees you up to negotiate with other possible Buyers, as their offers come in. Either way, don’t ignore an offer based on a hope that something better will come along. Instead, be proactive & be smart and negotiate your way to a better sale price. There will always be stories of Sellers who lost tens of thousands on the sale of their home. Perhaps this Seller bought at a high point & was forced to sell after the market corrected. Perhaps this Seller made a few poor decisions throughout the process of selling. Regardless of the reason, selling a home doesn’t have to equate to a loss. If you are willing to do your homework, put in the work, where applicable, work with professionals, you can sell your home for a profit, even in a down market.